It’s a season of new beginnings, and just like last year I find myself overwhelmed with memories of our first weeks in Jerusalem. It’s odd – I can hardly remember what I ate for breakfast this morning, but I can summon up exactly how my eyes felt, squinting into the bright sun bouncing off the white Jerusalem stone. Or how my legs felt, hauling reluctant children up big hills on a hot Shabbat afternoon when no buses were running. Or how my heart felt, as we had our first tentative and hopeful get togethers with new friends. Most of the time, I think I’m the only family member awash in memories. Terence studiously avoids nostalgia, and the girls are distracted by starting up their school years. But then out of the blue will come evidence that they, too, remember. That some of the many lessons we tried to share, stuck. The other morning Hannah marched down the stairs with two dolls, a Barbie and a slightly-broken, much loved doll that was handed to her, gratis, on the street in Madaba, Jordan. She announced that the girls were best friends, as different as they were. We chatted about Hannah’s own different friends, her kindergarten class that included 16 nationalities including Israeli and Palestinian, and has spoiled me for life as a model of a diverse community. 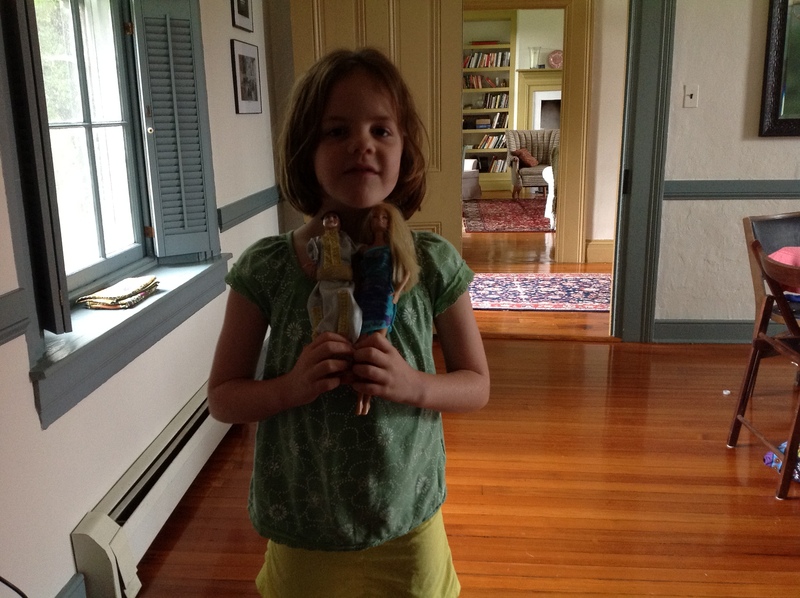 Hannah tried to swap clothes between the dolls before concluding that Barbie’s clothes were not modest enough for a Muslim. And this global awareness pops up in more serious circumstances, too. The other night at dinner, we were going around and saying one thing that surprised us about our day. Terence’s? “I’m surprised that the President is considering military action against Syria.” We talked a little about Syria and what is happening there. Terence and I explained that we weren’t sure what the President should do, but Hannah had a strong opinion. As soon as she finished eating, she went straight to her desk and penned this note. 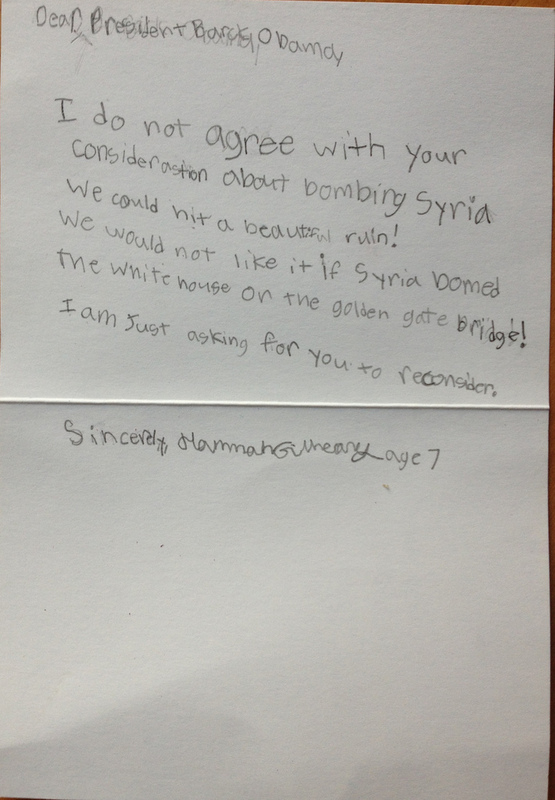 We mailed it off to the President, and I am hoping he will respond. Meanwhile they ask every day for the latest news. I am distraught about the situation in Syria, but glad that Hannah knows where Syria is and cares what happens there. My girls know it’s a big world, full of actual and potential friends who are nothing like us, and for whom we wish the same peace we want for ourselves.